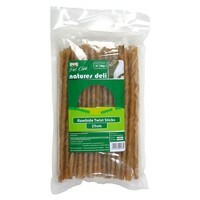 PPI Rawhide Twist Sticks are tasty treats that have been made out of 100% cattle hide, and are perfect as a treat or reward as part of a balanced diet. High in protein and low in fat, the chews are the ideal solution for reducing plaque and tartar build up on your pet's teeth; helping them to keep their teeth and gums healthy. Always ensure fresh water is available for your pet. These are great value for money AND good quality. My dogs love them. They are low fat treat which help keep their teeth & gums in tip top condition! Have recommended to friends & colleagues & will continue to buy in the future!